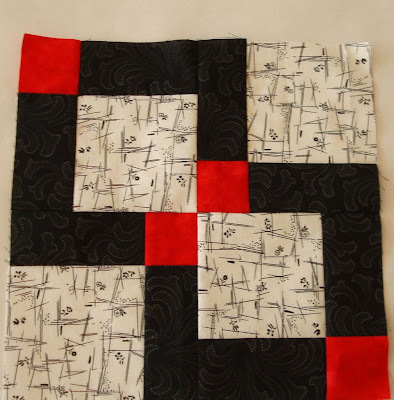 Some weeks I get a lot of quilting done and some weeks I don't. This is a "I don't" week. Oh well. I thought I would share a couple of blocks I'm taking down to Maryland with me. First is the block of the month. I really like this use of the Disappearing 9 Patch. I would be very happy to win this group of blocks! 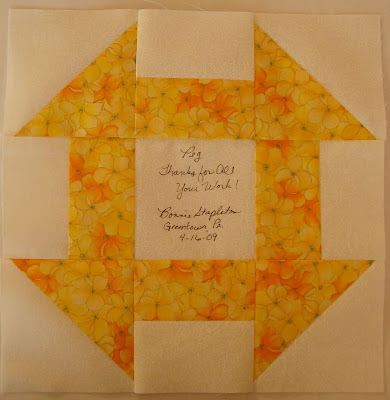 The end of our quilt year is coming for Faithful Circle Quilters in Columbia, MD. We make blocks to thank those ladies who are coming off the board. This year only our President, Peg is stepping down. I was happy to make this churn dash in yellow and white for her. It's hard to get a decent picture of this yellow. It really is brighter with more depth of color in it. I continue to work on the wonky 9 patch. I've got about 10 blocks done so far. This block doesn't come out square. (scroll down to the bottom to see it.) That will make it interesting when I get to planning borders and setting the blocks. Each block fits only a certain way which will make this all the more challenging. I am looking for a few more light batiks to go with what I already have. It will be fun to do a little shopping at Seminole Sampler, in Catonsville. I worked at this store when I first moved to Maryland, about 15 years ago. They have a wonderful selection of fabric. If you are ever in the area this is a must see fabric shop!